GET has continuously developed Local Government projects, aiming at the implementation of various Spatial Information Infrastructures – SDIs, based on the INSPIRE framework and the development of Urban Planning applications. The municipalities of Chania, Heraklio and Keratsini have proceeded to a contract extension to expand their SDIs, which have been enriched with urban planning data and new supportive functionality. These projects aim to organize the location-based information, as well as the urban planning data to a central geospatial system that leads to improved public services and the dissemination of information through the web. The urban planning application has been developed as an additional module to the SDI in order to highlight the legislation, the datasets and the town planning framework within the municipal limits. 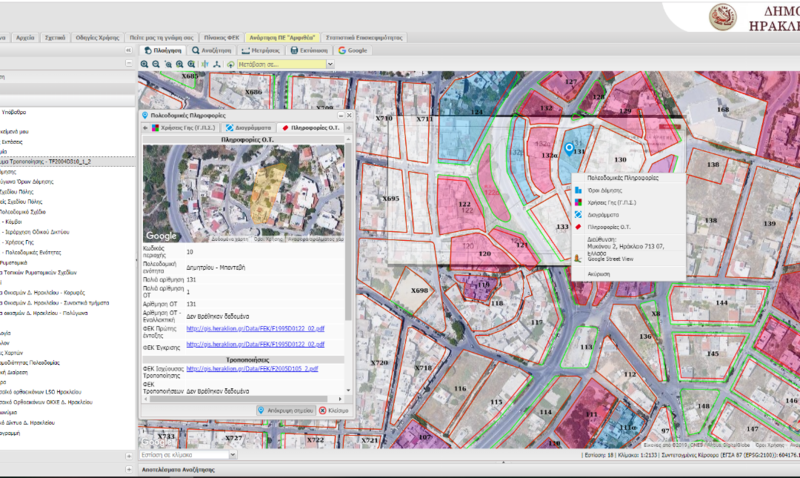 The technology used is based on free and open source software (FOSS) and it supports access to geospatial resources through open standards (OGC). The Local Government turned a new leaf with this powerful tool, which makes the urban planning information easily accessible to public. The SDI supports transparency policies and decision-making in many interdisciplinary sectors and it sets the foundation for e-Government. An overview of traffic statistics from Thessaloniki and Heraklion, which are on top 5 of the largest Municipalities in Greece, reveal real results concerning the beneficial use of the SDI. More than 20.000 users visited the SDI for the last three years. Over 50.000 sessions were counted. On average, more than 800 citizens/professionals per month interact with the online public services via the SDI, without visiting the Municipality.